The United Nations’ celebration of World Environment Day will be held on Monday, June 5 in Algiers, Algeria. This year’s theme ‘Deserts and Desertification: Don’t Desert Drylands!’ emphasises the importance of protecting drylands, which cover 40% of the world's land surface and are the habitat and source of livelihood for nearly two billion people. Secretary General of the United Nations Kofi Annan said: “For most dryland dwellers, life is hard and the future often precarious. They live on the ecological, economic and social margins. It is essential that we do not neglect them or the fragile habitats on which they depend.” World Environment Day was established by the United Nations General Assembly in 1972 as an event that encourages governments, individuals and community groups to participate proactively in countless activities to improve the environment. The United Nations Environment Programme (UNEP) chooses the theme and location for the event every year. This year marks the first time the official celebrations are held in North Africa. 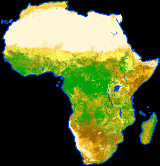 Algeria is an appropriate location for the event since a large portion of the country is covered by the sands of the Sahara, the world's largest desert. Algerian Minister of Environment Chérif Rahmani said in a press release: "My country, Algeria, feels honoured to have been chosen by UNEP as the host country for this day. We feel doubly honoured: first because the majority of our territory is made up of deserts; and second, because by honouring Algeria, all of Africa is honoured." Of the 5200 million hectares of drylands used for agriculture, more than 70% are classed as degraded. Africa, Asia and Latin America are particularly under threat, but some 30 million hectares of European territory bordering the Mediterranean are also affected, potentially threatening the livelihoods of 16.5 million people. The term 'desertification' refers not to the spread of existing deserts, but the creation of new ones through the degradation of susceptible arid or dryland ecosystems, which extend over a third of the Earth's land surface. Degradation is mainly due to human activities such as over farming or land clearance, although drought also degrades the quality and productivity of soil and vegetation, and the impact of climate change remains an open question. ESA is backing a satellite-based information service called DesertWATCH, working with national partners of four of the European countries most affected by desertification: the Greek, Italian, Portuguese and Turkish National Representatives to the United Nations Convention to Combat Desertification (UNCCD). 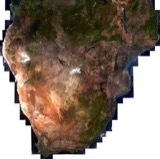 This satellite data is being combined with in-situ information, processing tools, models and geo-information systems (GIS) to create standardised and comparable geo-information products that can also be used to satisfy UNCCD reporting requirements. The DesertWATCH project is being supported through ESA's Data User Element of the Earth Observation Envelope Programme-2 (EOEP-2).